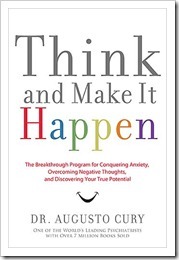 Think and Make it Happen, by Dr. Augsto Cury, caught my eye because of the catchy title, interesting premise, and seemingly lofty claims. Who doesn’t want to eliminate their fears, master emotions, release creativity and even "reinvent your entire life". What follows in the book are some interesting ideas and tools for dealing with your inner self, but unfortunately it falls short of being that one book that will solve all the problems of life. Overall I’d give it 2-3 stars, and while some chapters were quite good and helpful to many, I would not make it a general recommendation to friends. The book goes through Cury’s twelve principles for "thinking correctly" most of which are very helpful and reflect time-tested practices like setting goals, making good choices, knowing your limits, working through failure, taking personal control of your own life, staying positive, focusing on the present, and not acting rashly by letting emotions control your life. The first chapter "Being the author of your own story I really liked because it does take a different tack on looking at your life from the outside and realizing that you are the author and director of what is going on in your life and inasmuch as you are willing to act to write the script and make the necessary changes in your life, you can radically impact the action and the plot in your story. In the second chapter, Cury introduces his "DCD" technique for managing thoughts – that is, Doubt, Criticize, and Determine which will be mentioned throughout the book. In a nutshell this is the idea of monitoring your thoughts and picking off those that are negative or disturbing. Those negative thoughts should be challenged an analyzed critically and used for positive change or turned into something more helpful. Where things started getting murky for me was later when Curry talked about "Protecting Your Memory" and even altering your memory. Curry continues to attempt to draw examples from the life of Jesus to support his principles. And in the memory chapter goes as far as to say that "Judas’s biggest mistake wasn’t the betrayal of Jesus but his failure to learn transparency and realize that his greatest problems were within him." This does sound like what I might expect to hear from a psychologist, but statements like this led me to be more critical and guarded about the rest of the book. Curry continues with guidance on being a better listener and being open to dialogue – and I am a big fan of dialogue versus debate. He continues these ideas, which do build on each other, to working on listening to and responding to the dialogue within you own mind. True listening and productive dialogue are very important and are something people work a lifetime to do well, so spending time thinking and practicing these skills in really key. But then we move into "contemplating beauty" and are urged to "allow everyday moments to become magical experiences" which can occasionally be true, but not in many of my everyday moments. Curry encourages the reader to use "Psycho-adaptation" to turn ugly things into beautiful things, like turning the pain of the loss of a loved to a focus on "new interests". Having been through some painful times, there is a time for mourning and grief where just "thinking happy thoughts" will not turn the loss into "magical experiences". It is the inconsistency of Cury’s ideas, from insightful to questionable, which prevent me from rating this book higher. The chapter on Creativity seems rushed and out of sync with some of the others – there are much better coverage of Creativity in other entire books – and the chapter on being "Restored in Your Sleep" makes good points which would be key if a lack of sleep or troubled sleep were an issue in someone’s life. From my view Cury gets back on track with his chapter on living an "Enterprising Lifestyle" by outlining how to be looking for change, willingness to act on change and take a risk, accepting failure as well as success, and living live as an exciting adventure. But he then goes off on a tangent with a very "heady" chapter on "Thinking Existentially" where he tries to tie together all ideas of identity, cosmology, and religion – with a stress that "this book respects any form of belief, including atheism" – but at the same time making a case for a "God". The chapter floats between psychology, philosophy, theology, and never really "lands" in a way that makes it helpful to the reader. Again, this treatment of the topic further clouded my view of the chapters that really did seem to make sense and be helpful to me. Overall the book was one that made me think and had some good insights, but it also caused doubts and made me critical of the content and author. Good afternoon, It’s a rare find for a nice blog like this. I enjoyed it. Kudos to you. Have a nice day! Phil you are definately proud of your post as you should be. It is very well composed. appreciation for the time you put into this. I will dig and try to find some complimenting facts to add. Thanks again. I discovered your web log on yahoo and know a few of the posts. Superb workout! Hi, this was a really quality article. I’d like to write like this also – taking time and real effort to make a good article… but what can I say… I procrastinate alot and never seem to get something done. This is actually my first time i visit here. I found so many interesting stuff in your blog particularly its discussion. From the tons of remarks on your posts, I suppose I am not the only one having all of the enjoyment here! keep up the good work. Every time I come to Book Review: Think and Make It Happen you have another exciting article to read. A friend of mine was telling me about this topic several weeks ago. I think I will e-mail them the link here and see what they say. Good day from Russia! Will i be able to quote a post within your weblog with the link to you? I’ve tried emailing you regarding this issue but it seems i cant reach you, please response when have a moment, thanks. Do you care if I quote you on my website if I link back to your website? Thanks for this step by step procedure. Now I know what I am going to do. You saved me tons of headache hear. Wassup, I noticed your weblog on Yahoo Blogs and believe it is certainly incredibly fascinating and gives excellent subject matter. Thanks with regard to this good post, I will certainly share this on Twitter. Have a pleasant day. Hi! I have also been writting about the same topic and it’s great to see there are other interested in the same things! At roughly 100 dollars per pack—the predominant rate at local pharmacies—people may have to spend as high as 500 dollars monthly only on Viagra pills! Ehila… Hello there. Sorry if my english language isn’t nice.anyway…i just wish to say that i appreciate this article a lot.Many thanks! The funeral insurance policy can also insure that the dead receives the funeral that they might have wanted while, leaving money available for your friends to look after any other last expenses you may have left without them having to pay for them with their own money. Pure genuis in this, well writen. It gets apparent that there is a lot to acknowledge around this. I think you have made a stack of great points in your clause. It turns evident that they’re is a bunch to no around this. I believe you have named a bunch of good points in your clause. Ehila… Hi. Forgive me but my english isn’t very good.anyway…i intend to tell that i like this page so much.Say thank you! Do have some sort of email system where I can get your blog posts emailed to me? There are still some other things to consider, but I agree with what you’re saying. Good point. Thanks for the relevante information..Keeped me entertained for ages. Love the layout of your blog. Perhaps we can be blogging buddies. Fantastic stuff you’ve got here. It’s a real treat to read. I have happened to come across your website in yahoo and I have to say what a wonderfull post. If you would also like to see some more great information then please be sure to check out this website.